No known hurricane has ever crossed the equator. Hurricanes require the Coriolis force to develop and generally form at least 5° away from the equator since the Coriolis force is zero there. Are the physics of the earth and tropical systems such that it is impossible for a hurricane to cross the equator after forming, or are the forces working against this occurring so strong that an equator crossing hurricane is an exceedingly rare event we may not witness in 1000+ years? It is well known that the Coriolis force is needed to form a hurricane, and the figure of 5oN/S as the minimum for formation is widely publicized. You can also find record of tropical storm formation near India as far south as 1.4oN. The problem of crossing the Equator isn't one of hurricane formation though, it is one of hurricane motion. Due to Coriolis, a hurricane initially moving parallel to the Equator will start gaining a poleward component to its motion, thus moving it away from the Equator. But, because this is due to Coriolis, if you could get a storm close enough to the Equator, this effect would not be as strong. This would be an improbable track, but I'm not willing to call it impossible. We haven't had satellites all that long, and all we can really say is that it hasn't happened since we've been watching. If a storm did cross the equator though, what would it do? Nothing at first, but as it moved further into the opposite hemisphere, Coriolis would be working against the storm and it would spin down, become disorganized and cease to be a hurricane, probably becoming a remnant low. The Coriolis effect is necessary for FORMATION but NOT for MAINTENANCE of a tropical cyclone. Once formed, in a full-fledged tropical cyclone of hurricane intensity the wind balance is cyclostrophic, between the pressure-gradient and centrifugal force, with the Coriolis effect negligible by comparison. This is especially true if the tropical cyclone is small but intense. Thus a full-fledged tropical cyclone of hurricane intensity would encounter NO difficulty if it crossed the equator. Its circulation would be classified as baric before crossing the equator and antibaric afterwards. Thus a full-fledged tropical cyclone of hurricane intensity will NOT weaken upon crossing the equator due to the reversed Coriolis effect (although it may weaken or strengthen due to other causes). An antibaric cyclone is fully consistent with the laws of motion. Except on the smallest scales such as dust devils or whirlpools it is difficult to initiate, but once initiated it can be stable. A tropical cyclone crossing the equator may be the only way that a synoptic-scale antibaric cyclone can be initiated. If a tropical cyclone, especially a large one, crosses the equator and attains appreciable latitude in the opposite hemisphere, say the outer tropics or lower middle latitudes, then the gradient wind approximation rather than the cyclostrophic wind approximation is applicable. But antibaric gradient wind is still a stable flow. See for example James R. Holton and Gregory J. Hakim, Dynamic Meteorology Fifth Edition Section 3.2.5 on pp. 74-77. In baric gradient flow the Coriolis and centrifugal forces acting outwards balance the pressure-gradient force acting inwards. In antibaric flow the centrifugal force acting outwards balances the pressure gradient and Coriolis forces acting inwards. Thus for a given pressure gradient and radius of curvature of the isobars, the centrifugal force must be stronger, and hence the wind speed higher, for an antibaric tropical cyclone than for a baric one. The First and Second Laws of Thermodynamics require that the pressure gradient and radius of curvature of the isobars must adjust to the exergy supply --- not vice versa. According to Holton and Hakim, an antibaric (synoptic-scale) hurricane can easily exist if it is centered say only a few degrees from the Equator in the opposite hemisphere, but this becomes more and more difficult and hence more and more unlikely with increasing latitude in the opposite hemisphere. Whether at some latitude in the opposite hemisphere it becomes absolutely impossible may be an open question. Small-scale antibaric cyclones (dust devils, whirlpools, waterspouts, and to a lesser extent tornadoes) can easily exist at any any latitude where sufficient exergy exists to generate and maintain them. Not the answer you're looking for? Browse other questions tagged meteorology coriolis tropical-cyclone equator or ask your own question. Can a hurricane with different spinning direction be formed accidently? Why is the troposphere 8km higher at the equator than the poles? Why is the Atlantic Hurricane Season defined as being between June 1 and November 30? Can an Atlantic hurricane enter Mediterranean sea? When there is snow on the ground, can a hurricane still form? Does a hurricane with a smaller eye have a lower pressure? Would a hurricane increase intensity due to increasing translation speed? Why does more sunlight hits the equator than the ecliptic path? 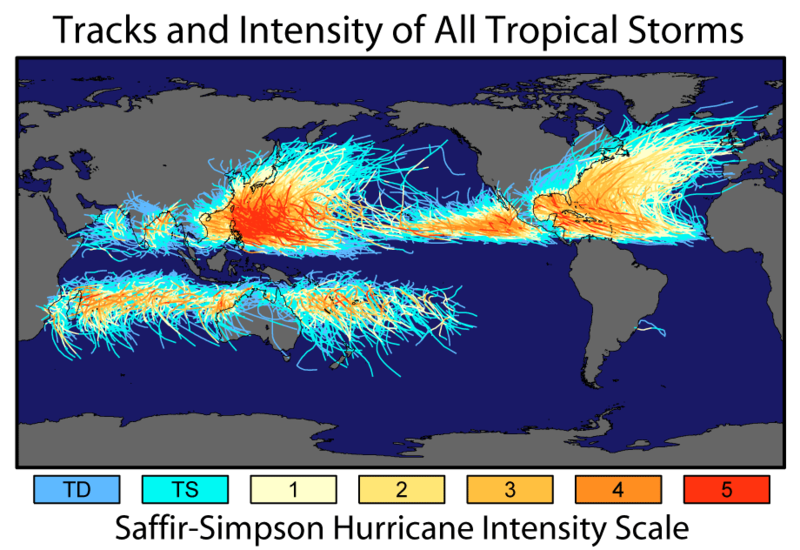 Has a hurricane or cyclone ever reformed after passing over a large land mass?